The Lady Vols officially have a new head coach. Tennessee officially introduced former Lady Vol player Kellie Harper as the next head coach of UT’s women’s basketball program. Harper is just the third head coach of the Lady Vols in the NCAA era, joining legendary head coach Pat Summitt and Holly Warlick as the only coaches to hold that distinction. Harper returns to Knoxville with 15 years of head coaching experience under her belt, making stops at Western Carolina, NC State, and Missouri State before taking over at Tennessee. Harper played under Pat Summitt in the 1990s as a point guard and helped the Lady Vols win three-straight national titles in 1996, 1997, and 1998. 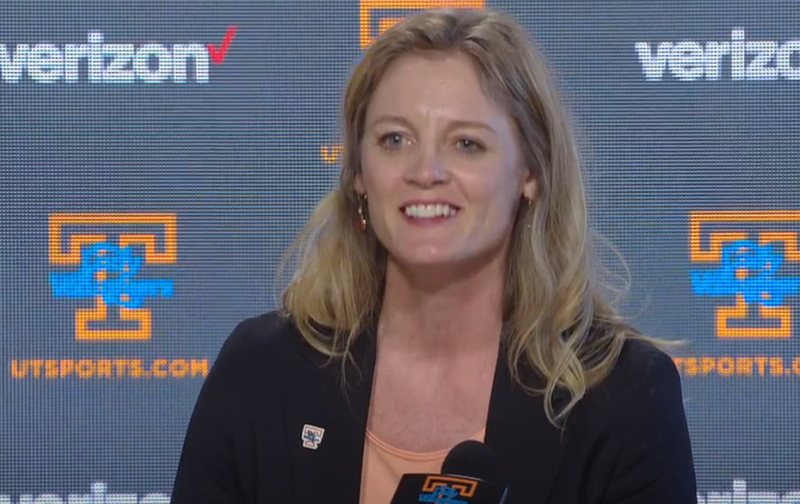 Tennessee held a press conference on Wednesday afternoon to officially welcome in Harper as the Lady Vols’ head coach. UT Athletics Director Phillip Fulmer started things off in the press conference, then Harper herself took a seat behind the mic. Fulmer addressed the media once again after Harper finished up. Did you miss the press conference live? We have the full recording of the press conference for you below.